Since Silent Spring was published in 1962, the number of texts about the natural world written by women has grown exponentially. The essays in Women Writing Nature: A Feminist View argue that women writing in the 20th century are utilizing the historical connection of women and the natural world in diverse ways. For centuries women have been associated with nature but many feminists have sought to distance themselves from the natural world because of dominant cultural representations which reflect women as controlled by powerful natural forces and confined to domestic spaces. However, in the spirit of Rachel Carson, some writers have begun to invoke nature for feminist purposes or have used nature as an agent of resistance. 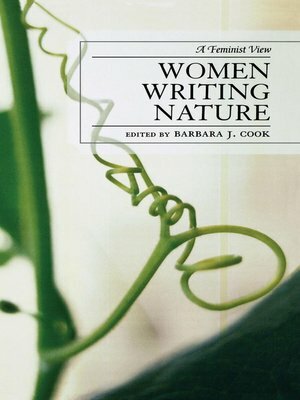 This collection considers women's writings about the natural world in light of recent and current feminist and ecofeminist theory and finds a variety of approaches and perspectives, both by the scholars and by the authors discussed, culminating with the voices of two women, activist and scientist Joan Maloof and Irish poet Rosemarie Rowley, who both write about the natural world from a feminist perspective. Barbara J. Cook is assistant professor of English and WomenOs Studies at Mount Aloysius College.